Whether this is the same incident as this – “At Marlborough Street Police Court, on January 30, Marcella Leonie Fester (35), Goodge Street, Wi, was charged with being in possession of a ” dangerous ” drug without being authorised”. (Chemist and Druggist Mar 33). She was bound over for three years with a residential condition and had to pay £6 costs.” – I don’t know, but it does not appear to be. This, remember, is the woman described as Elvira’s “very closest friend”. The prison doctor’s confident assertion of no evidence of drug use looks even more doubtful than ever. I can find no anecdotal and precious few references of any kind to Leonie. Someone must know more about her. Her 1932 addresses are worth noting. 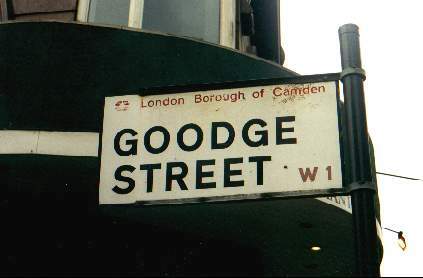 She moves from King’s Road to Goodge Street (i.e. Chelsea to Fitzrovia). This may mean nothing, but as I have mentioned before there is a Fitzrovian connection with some of Elvira’s acquaintances in the “post-party” years (notably Napper Dean Paul). Goodge Street retained a Bohemian image well into the 1960s ( viz Donovan’s “Sunny Goodge Street”) but all that is, sadly, long gone. Interesting re. Leonie Fester. Those sound like two cases- normally when warnings were given and not heeded, the Met would prosecute next time. Unfortunately the Pates and Riley book does not provide a proper reference as to the exact source. I haven’t found anything else about her either, as yet. She is an intriguing figure. She is, Chris.As it’s such an unusual name you’d think she would be easier to track down. Her daughter died less than ten years ago so there must be someone still around who knows something. I can’t add much substance to the story of Leonie but her father was a Polish-Austrian, Leon L Kochanski, and her mother Eugenia was from Liverpool. It is her will in the London Gazette and the solicitor seems to be a relation of Leonie’s second husband Emil Fester. After a few false starts, such as emigrating to New Orleans and later leaving his wife “with her own means” on her own with their small son in Derbyshire, Leon and Eugenia lived first in Earls Court then West Hampstead and he worked as a bank clerk. They used little imagination when naming their children as Leonie’s elder brother was called Leon Cassimir Marcel. He served with tbe British South African Police in Mozambique in 1913 then as an army captain in India about 1922. He and his wife Frances Sarah lived in Barons Court until his death in 1935 when he left £30. His wife died in 1966 in Northants. Her husband Nicholas De Belieaff is credited with the photorgaphy of 1937 film of Synge’s Riders to the Sea. Yes, I saw that but have also found,as you probably have, too, that Leonie was travelling as Mrs Fester from about 1919, long before the marriage in 1924. Her phone book listing in 1932 (and until 1937) was Carlisle Mansions, SW1, just behind Westminster Cathedral in Victoria so that Goodge St address might have been a friend’s place. In 1929, she is listed at “Temperley,” Park Hill, Bicklerly, Kent, where Emil took his oath of allegiance (he was Belgian) to the Crown in 1911. He lived there from at least 1908. That 1929 listing is probably out of date as they seem to have moved to Chobham Park abiut 1927. I hadn’t spotted that – I’m rubbish with these records – the 1929 electoral register lists them at Queen Street but abode Chobham House in brackets – what does that mean?